These Door Bell Chimes look great in your entry. Designed to replace the plastic one you currently have. 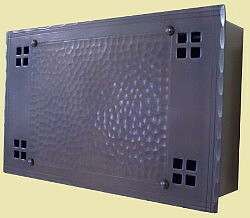 Hand hammered copper chime case covers a standard 2 note (front/back door) wired door chime (included). Works with standard 16 v transformer (not included). Field As shown on the previous page, a solid cover with scalloped edges and a plain small border around the hammered and raised number area. Greene A solid cover with scalloped edges and indented corners with a hammered border around the hammered and raised number area. Pacific As shown above right, a solid cover plaque with scalloped edges and four square cutouts in each corner. Their are a pair of intersecting lines in the otherwise plain border. We are pleased to add these hand-hammered and hand-finished door bell chimes to our collection.